Well, he may not have actually changed his motto for the Rodeo Bowl, but his team definitely got into the spirit of the Texas-themed competition. The Rodeo Bowl is the highlight of one of college football’s best bowl weeks, and Vanderbilt had an opportunity to face off against Baylor before their Texas Bowl matchup on Thursday night. The teams competed in seven rodeo events throughout the night as country music blared in the background and families of both teams cheered on their players. Vanderbilt took home the event by a score of 4-3. Since the event’s inception, nine of the 12 Rodeo Bowl winners have gone on to win the Texas Bowl. The first event was goat dressing. As a native Houstonian, I must preface this by saying that this is not an actual rodeo event. But boy, was it exciting. Baylor and Vanderbilt each had two players run to the other side of NRG Arena, put boxer shorts on a prize goat, and run back to their original spot. Alim Muhammad and Donovan Sheffield represented the Commodores, but Baylor prevailed. Next up was calf herding. A group of five Commodores herded five calves into a gate in around five seconds, while Baylor took over a minute to do so. With the score tied 1-1, the teams moved on to the third event. Three players and one coach from each team took turns roping a wooden steer with a lasso. Then, the teams picked a representative for the sudden death lasso-off. Vanderbilt prevailed to take a 2-1 lead. Another made-up, but still hilarious event followed. The calf ribbon pull was exactly like it sounds. Both teams sent four players to chase down a pack of calves. In the pack, one calf had a green ribbon or a gold ribbon for Baylor and Vanderbilt, respectively. Each team had to take their ribbon off of the calf and return it to the judge. Sam Dobbs, Jamauri Wakefield, Chris Pierce, and LaDarius Wiley took time to strategize before the timer started, and they were able to find the calf and the ribbon in just 15.2 seconds. Vanderbilt took a commanding 3-1 lead as the players cheered and jumped up and down. The Commodores only needed one more victory to clinch the Rodeo Bowl title. The fifth event was barrel racing, where Dare Odeyingbo and Louis Vecchio rolled Harrison Smith, who was dressed as a rodeo clown, in a barrel. After rolling the barrel to the other side of the arena, the pair helped Smith out of the barrel, and Smith ran back to the original spot. Baylor barely won to narrow the gap to 3-2. The sixth event, hay bale stacking, involved eight players passing hay bales down a line and restacking them at the other end of the arena. The lineman took charge and led Vanderbilt to victory. With the Rodeo Bowl already clinched, Vanderbilt took on Baylor in one last event: a relay race. Teams had to dress in a horse costume, run to the other end of the arena, race around a barrel, and pass the costume off to the next person in line. Vanderbilt sent their wide receivers out for this event. It was close, but Baylor won the final event, making the final score 4-3 in favor of Vanderbilt. 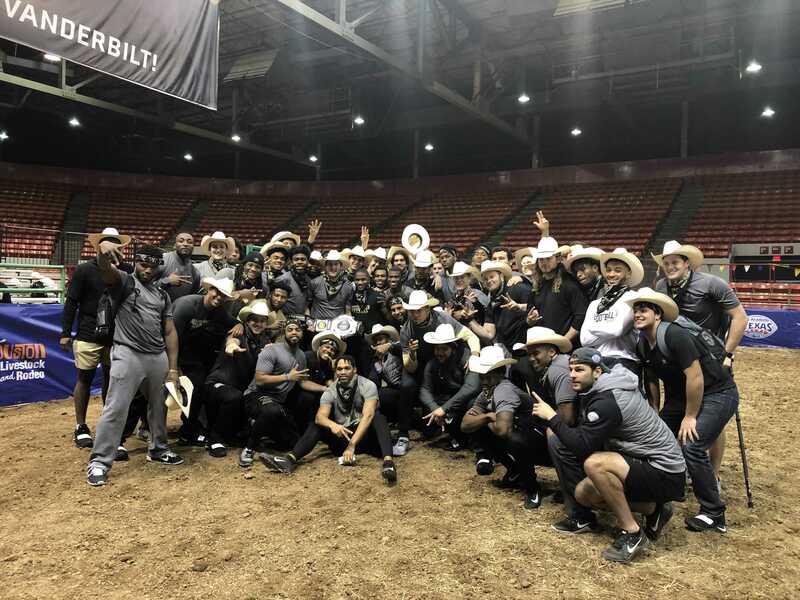 The winner of the Rodeo Bowl has won the Texas Bowl nine of twelve times since the Rodeo Bowl was created, so the victory bodes well for Vanderbilt in the Texas Bowl. Watch the Commodores take on Baylor on Thursday night at 8 PM Central on ESPN.